KUALA LUMPUR: The eldest son of the late Temenggong Jugah, Tan Sri Leonard Linggi believes that mistakes in made past should not be repeated and once Sarawak has reclaimed ownership of its oil and gas (O&G) assets, the profits should be shared by all Sarawakians. Speaking at the ‘Federalism: Federal constitution and MA63’ forum today, Linggi stressed that the state’s O&G assets needed to benefit all Sarawakians rather than only a select few as it was in the past. “All of these assets once reclaimed should be shared by all Sarawakians and not just selected few otherwise people in Kuala Lumpur will laugh at us. “Once it is finalised, there is no stopping us if we would like to work with institutions like Petronas, where we work together or on our behalf, and share the profit, accordingly,” he said. According to Linggi, Sarawak had sound legal principles to claim back its O&G rights through the Oil Mining Ordinance, 1958 (OMO 1958). “Our O&G assets are one of our most important assets because profits from it could bring so much more development to our state. To the 5,000 odd Sarawakians attending the forum today, he advised the crowd to be patient for results in MA63 discussions. “Dont fight, we will negotiate and negotiations may take time,” he said. Should there be any stalemates during negotiations, Linggi detailed that the state could always take up the issue under schedule 8 of the MA63. Schedule 8 of the MA63 says that Sabah and Sarawak can take their own measures to enforce and implement MA63, without having to amend the Federal Constitution. A motion was previously proposed by then-Chief Minister Datuk Patinggi Tan Sri Adenan Satem but withheld at the last moment as the state government opted on a diplomatic approach with the federal government on resolving the issue of the unfulfilled rights under the MA63. 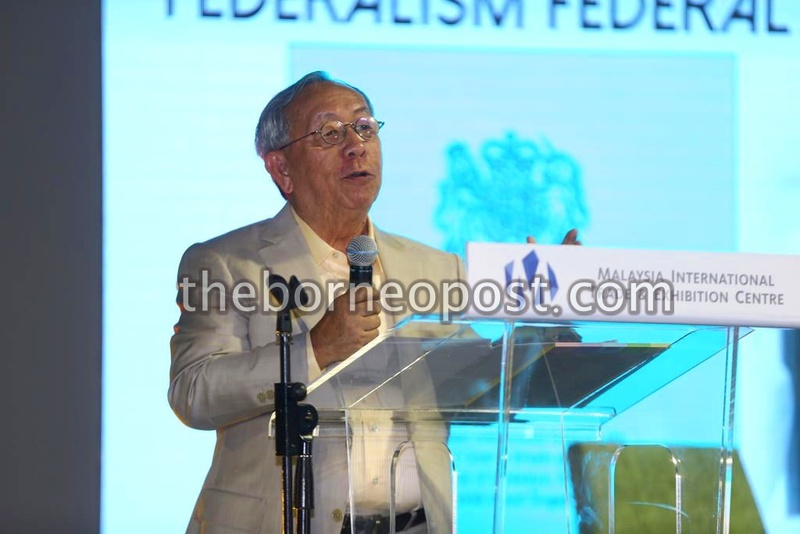 “If you (federal government) are not happy, bring them to your legislature and from there Sarawakians can bring them to their own state legislative to take up,” he said. Referring to an old Dayak saying, Linggi urged the federal government to not fall into the ‘tebu principle’ or ‘sugarcane principle’ whereby things are sweet in the beginning but turn bitter towards the end. “If you applied the ‘tebu principle’ to Sarawak’s participation in Malaysia today, can you say we are satisfied now? If we are not, what’s the best way to live up to the promises of sweetness for us? “Sarawakians are now questioning more, they want better lives, and they want a better Malaysia,” he said.